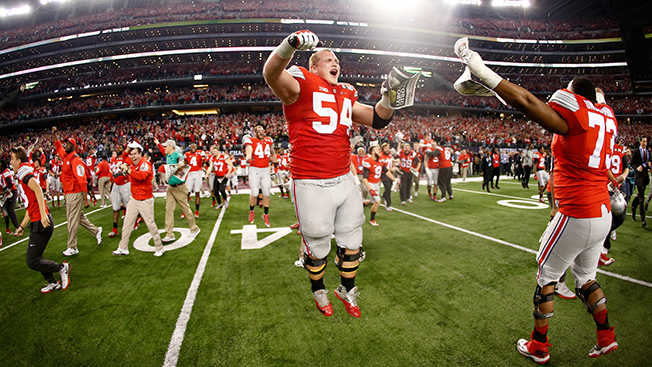 When Ohio State won college football's championship game Monday night, it was obviously good news for fans back home. But it was especially good news for those who took part in a furniture promotion that ended up refunding $1.5 million back to the shoppers. The promotion was open to those who spent more than $1,999, with no upper limit, as long as they shoppped at one of four local Morris Home Furnishings stores and 11 licensed Ashley Home Furniture Stores in the Dayton, Columbus and Cincinnati areas, along with some locations in northern Kentucky. It was obviously a gamble, one that will end up costing the retailer about $1.5 million in refunds. But the company says it was also a publicity coup that more than paid for itself in exposure. "We'd absolutely do it again," said Rob Klaben, vp of marketing and advertising for Morris Home Furnishings. The idea was born after the company's leadership heard of another store making a similar offer, and Morris Home Furnishings thought it could help drive store visits before the end of the year. "Typically during the week before Christmas, it's not a big time for people to buy furniture," Klaben said. "They're thinking more about holiday gifts and wrapping up their holiday shopping. It really created a spark that now is a great time to buy a sofa or bedroom furniture." Because it was not an official sponsor of the NCAA playoff, Morris Home Furnishings couldn't name drop Ohio State or the championship matchup. So instead it loosely referred to the stunt as the "Big Game Promotion." Print ads were created in house, while tapping Lionshare Media to create TV commercials, which ran on local TV stations and local cable. Because the promotion ended Jan. 1, the chain didn't need to buy expensive airtime during the playoff's final games. Most importantly, the company paid for insurance. Morris Home Furnishings had a third party underwrite the promotion. The insurer received a portion of the promotion's sales just in case Ohio State won and the other company would have to cover the cost. However, Klaben admits he thought Ohio State's odds of victory were relatively slim given that the team was on& its third-string quarterback during the championship run. In total, 500 customers took advantage of the promotion, with purchases totaling $1.5 million. Though company executives haven't looked at all the records, Klaben says that single payouts could reach up to $15,000. But the promotion also because became a trending topic on Facebook this morning, and the furniture retailer's stunt became one of the nation's most talked-about game-related ads. And all that was achieved without Morris Home Furnishings having to buy any media during the championship. Klaben said based the number of people who are now coming into its stores "anxious" for Morris Home Furnishings to offer another game-based deal, the company is considering another opportunity for free furniture.